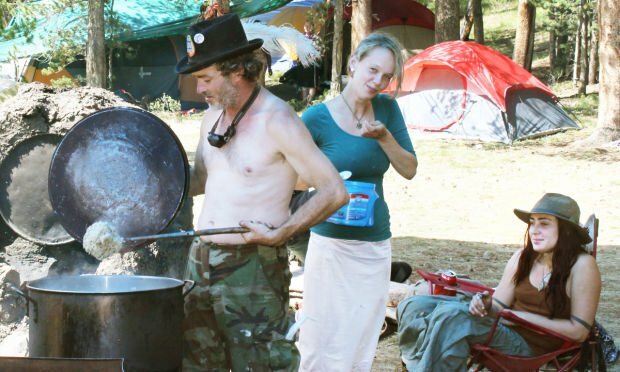 “Doc ZsuZsu” cooks up a large pot of rice at the Rainbow Family gathering at Jackson on Thursday. The others in the photo are unidentified. At the site, there’s an outer ring of people who set-up their camps close to the main parking area, where drinking alcohol is tolerated. Inside, closer to the main meadow, alcohol use is heavily frowned upon, and it’s where multiple kitchens are established to feed the thousands who come from across the country. BUTTE -- Despite making only two arrests at the Rainbow Family gathering near Jackson this summer, the U.S. Forest Service spent nearly $400,000 on law enforcement and more than $500,000 overall. Along with an expenditure of $395,540 for law enforcement, the Forest Service spent $177,821 on the administration side of managing the event. The total cost for the U.S. Forest Service relating to the Rainbow gathering was $573,361. The gathering near Saginaw Creek in the Beaverhead-Deerlodge National Forest about 10 miles southwest of Jackson drew about 10,000 people. It officially ran from June 21-July 7, but Rainbow members were in the area for about a month. About 20,000 Rainbow people had gathered at the same site in 2000. 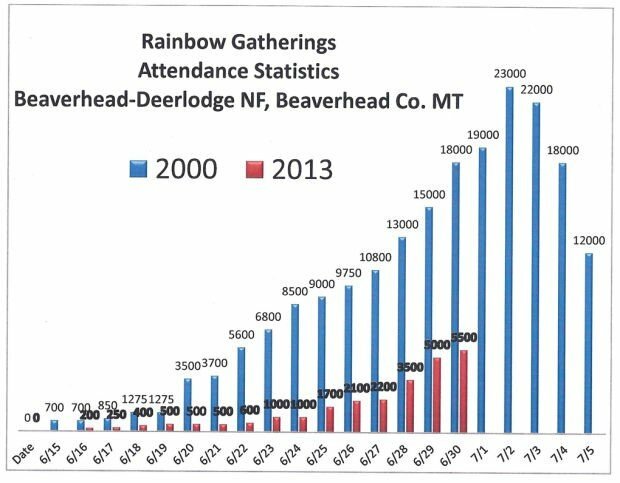 In an email to the Montana Standard, Tim Walther, assistant special agent in charge of law enforcement for the Forest Service, wrote that the size and complexity of the Rainbow gathering exceeded the capacity of local Forest Service law enforcement personnel. He said that officers had to be brought in from around the country, which increased overtime, travel, and lodging expenses. He also said the Forest Service had to be prepared for a crowd much larger than the 10,000 people that came this year, based on the amount of people who attended the 2000 gathering. Along with the thousands of people gathering at the site near Jackson, there were nearly 1,500 vehicles. People camped in the woods for weeks and set up kitchens, bathrooms, and other structures. Walther wrote that the Forest Service policing of the event shouldn’t be judged by the amount of arrests. Forest Service spokeswoman Cass Cairns told The Montana Standard during the gathering that the Forest Service had about two dozen law enforcement officers at the site who patrolled the event on a rotating basis. The Forest Service also paid Beaverhead County $10,000 for extra support from its sheriff’s department. Along with arresting two individuals, the Forest Service detained and turned over four people who were arrested by the sheriff’s department and one person who was arrested by the Montana Highway Patrol. And even though there were few arrests, there were hundreds of incidents that involving law enforcement, according to the Forest Service. Walther said 405 incident reports were written up for Rainbow people not following the operational plan agreed upon by the Rainbows and the Forest Service. There were also 399 warning notices for people not following Forest Service regulation for public land and 49 tickets. Forest Service spokeswomen Patty Bates told the Rotary Club in Dillon that the Rainbow members that gathered this year near Jackson were rowdier than in years past. Robbie Gordon, 67, of Taos, told a different story to the Montana Standard. In a long interview conducted during the gathering at the site near Saginaw Creek, Gordon said the Forest Service police presence was excessive and intrusive. When asked by The Montana Standard to respond to complaints about an excessive presence at the event, Walther said he had no comment. About 30 Forest Service employees were involved in the administrative side of the event. Those salaries ran $154,196, while supplies totaled $11,939 and travel expenses reached $10,186. There was also a $1,500 agreement with the Bureau of Land Management for radio support. BUTTE — Consider them a very expensive houseguest. How much did the Forest Service spend on the Rainbow gathering?